Darkroom work, to traditional black and white photographers, is the crucial "final step" in the making of a creative image. Once shot, the film must be processed, washed and carefully stored for printing. Large format photographers often require ample space to process and print their work. Thus, in January 2000 I began work on a 1,200 square foot darkroom complex. Several years in the making, this space now provides a comfortable environment for the critical processing, printing and finishing of my black and white work. The entire darkroom consists of four interconnected rooms. The printing room contains negative files, photographic paper safes, a negative inspection and cleaning area, and six enlargers. This room is entirely dry with no water or chemicals present and is constantly cleaned with an electrostatic air scrubber. Here, negatives are examined, cleaned of dust, and loaded into enlargers for printing. The enlargers, equipped with cold light and LED light sources, handle 35mm, 6x7cm, 4x5", 5x7", 8x10" and 11x14" negatives. 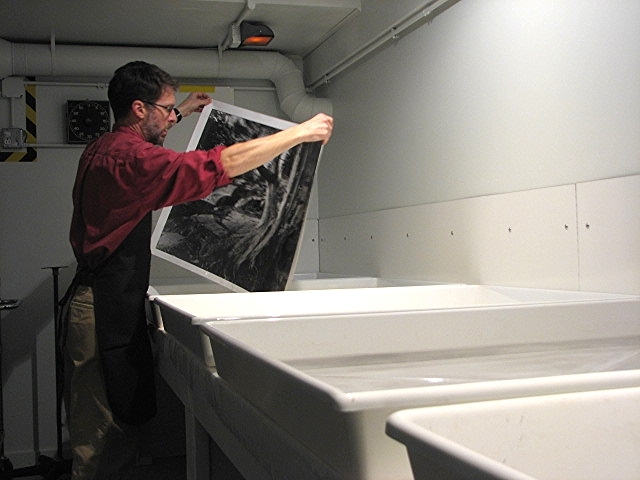 The laboratory is used to process, wash, and dry film as well as prints ranging in size from 8x10" to 40x60". It also contains a dedicated station for the making of special print contrast control films known as unsharp masks. Film processing is done in tanks by nitrogen gas-burst agitation as well as in trays. Prints are processed in various sized trays, including 20x24", 30x40", and a stainless steel 42x65". The next room is also a lab space but is both wet and dry and devoted to print finishing. It includes dry chemical storage, a print spotting area, a custom stainless steel print-washing sink, and a Seal 44x68" vacuum dry-mount press. This space is used for print washing, drying, spotting and mounting. It also houses all of the darkroom plumbing equipment such as water heater, pumps, filters, and compressed air systems neatly installed beneath a sink and countertop.